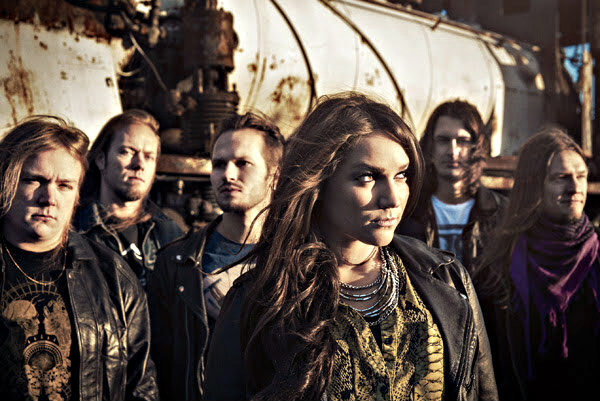 When you look at the facts, presupposition takes place without hearing a note from this six piece, female fronted melodic metal Finnish band. 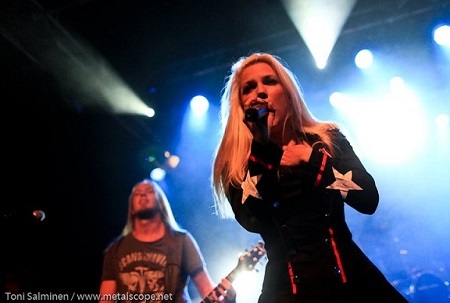 Most people would think female vocals + keyboards = a Nightwish-styled act right from the start. Shear steer away from those comparisons on their debut album, as the dual guitar play certainly has a heavier overtone, the bassist can actually run in the John Myung/ Geddy Lee/ Steve Harris heroic camp and the female vocals aren’t mere cut and paste melodies with gothic or pop flavoring. After ingesting a fair amount of playbacks on this fine effort, I contacted keyboardist Lari Sorvo who happily delved into the history of the band as well as his thoughts on a variety of topics I fired away at him. Blistering.com: Can you give us a brief overview of what got you interested in music and at what point in time did you move from a music listener to wanting to be in bands? Who were some of your initial inspirations as far as bands or artists? Lari Sorvo: I have always been interested in and listened to music from a very young age. I can’t really remember when it all started, since I have always actively listened to the radio and all kinds of records. As for my musical background, I played classical piano for several years as a teenager, but I lost my interest in it pretty fast . I had started to discover hard rock/metal bands such as Guns ‘n’ Roses and Metallica and I really loved their heavier sound. I didn’t have any plans to continue playing piano in any form at this point. However, a few years later at the age of 15, I found out that a few guys from my school had a hard rock band and that they wanted to spice up their music with some keyboard parts. Somehow I ended up playing with them and this is where my personal band experiences started. It wasn’t planned in any way, it just happened. This was also when I met Mikael [Grönroos] for the first time, since he was the guitarist of the band. He is the member of Shear that I have known the longest. When I joined the band I was really into neo-classical metal bands. One of my biggest influences at that point was Stratovarius, who had just released their album Visions. 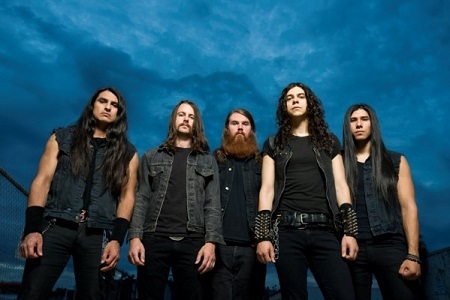 Blistering.com: How many different members or incarnations of Shear did you go through before this lineup came together in 2008? Do you think it’s been helpful that most of these musicians have played with each other in previous bands or were friends prior to coming together for the current Shear sextet? Sorvo: Actually Shear as a band didn’t come together before 2008 when the six of us decided to form a band together. Therefore I would call the current lineup as the first incarnation of the band. Most of us had, however, played together in many different bands and projects before the formation of Shear. It has definitely been helpful that most of us have known each other asfriends and played together for a really long time. Besides musical talent, a band also requires a lot of communication and matching personalities to function as a unit. Since most of us already knew each other prior to forming Shear, we didn’t have any problems coming along as a band. Furthermore, we were also aware of each other’s strengths and weaknesses which is an important aspect when writing music. Everybody knows how you should build up the songs to get the best outcome out of every member of the band. Blistering.com: What can you tell us about the first release In Solitude that came out in 2009, as two of the four songs appear on the debut album, will the other two songs possibly appear on your follow-up toBreaking the Stillness? Sorvo: As you already mentioned, this was our very first release as a band. The four-track EP showcases some very straightforward songs and a more progressive side of the band as well. This is what our band is all about, and a similar pattern can be found on the album too. Some of our songs could be considered “easier ” for the listener, while some might require a few more listens before getting the hang of it. Two out of the four songs on the EP appear on the regular version of the album, but the Japanese release of the album actually contains three out of the four tracks. So only one track was left out, not sure if we’ll re-record the song for our future albums though. Blistering.com: Lifeforce Records signed the band, and it appears that the label’s focus is expanding beyond their normal heavier parameters to include more melodic bands such as yourselves. What convinced you that this would be the best label for Shear, and were there other possible deals in the making during the two years before signing with Lifeforce? Sorvo: Before signing with Lifeforce, we negotiated with other labels as well. A couple of labels were interested in us and we discussed different options with them. However, we didn’t feel that the overall atmosphere felt right with them. Even though music is business, it can still be done in a fun and passionate way. At the end of the day Lifeforce was the best choice for the band since they were really enthusiastic and excited about our music, and this was definitely a deciding factor for us. It’s true that Lifeforce has a large amount of quite heavy bands, but they also have melodic bands and bands with female vocals. Personally I think it’s important for a label to have a wide repertoire of bands. Blistering.com: What I love most about Breaking the Stillness is the versatility between a heavier, riff oriented guitar tone, keyboards that aren’t necessarily of the ‘flowery’ variety and Alexa’s [Leroux] vocals that are more in a rock/metal vein and not as gothic sounding as many melodic female singer employ these days. How do you describe the Shear sound to newcomers, and are you happy with the variety of songs you developed for this debut album – what are some of your personal favorites? Sorvo: I think you nailed it pretty well with your description. From the very beginning it has been a conscious choice of ours to be a metal band, not a symphonic piece of orchestration with distorted guitars. You don’t need massive orchestrations to make a big and melodic soundscape. Actually, I think many bands try to hide their lack of originality with big orchestrations. There are already too many bands that try to mimic bands such as Nightwish, and we are definitely not one of them. Many bands seem to think that having a female vocalist would force them to play a specific type of music. This makes the majority of the bands very boring and repetitious. I think we have succeeded in making a catchy, yet heavy, and multi-tiered metal album that doesn’t wear out after a few listens. Naming personal favorites is pretty hard since this is subject to change depending on my mood. I like the song “Scorched” pretty much since it’s a nice combination of the melodic and more riff oriented sound of the band. The song “Stillness” also has a very nice overall vibe to it. I do like all the songs on the album but it would be quite silly to name all of them, wouldn’t it? Blistering.com: Another aspect that separates Shear from the pack is the technically fluid bass play from Eerik Purdon, most prevalent on the track “Someone Else’s Eyes.” How often does the band get the chance to rehearse together, and does anyone have any special schooling or theory training to help improve their instrumental skills? Sorvo: Everyone in the band is quite busy with various areas in life but we try to practice together as often as possible. Especially before live shows we rehearse together to get the set as tight as possible. In addition to rehearsing together as a band, everyone in the band individually practices in their spare time. Most of the band members have some kind of background in music theory, and some of our members have also played other instruments prior to picking up their current instrument. Blistering.com: Metal consistently makes the national Finnish charts against some of the biggest international pop artists. Is the marketplace that strong for all types of domestic metal in your home country? Are consumers that rabid for metal product- both in terms of physical and digital sales? Sorvo: Yes and No. While it is true that metal bands are a regular site on the Finnish charts, one has to remember that Finland is a pretty small country with approximately 5.5 million inhabitants, so the sales don’t need to be huge to enter the charts. I’m not completely sure on the numbers, but my perception is that to enter the lower parts of the Finnish top 40 chart, record sales of a few hundred copies should be sufficient. On certain periods of the year it might be much harder to hit the charts, though. But it is definitely true that the metal market is pretty wide spread and most metal bands are considered pretty mainstream here in Finland. Blistering.com: What type of touring plans do you think will happen with Shear in 2012? If you had the chance to set up a dream three band tour package, who would you want as tour mates? Sorvo: We definitely considered us a live band rather than some studio project, so we try to play as many shows as possible. The number of venues for small and middle sized bands in Finland is somewhat limited, so there is only so much gigging you can do here. Ideally we would like to play abroad as much as possible. I really hope that we will get a chance to do this too! Picking up a three-band dream tour package is really hard. There are a lot of good bands that would be cool to tour with. Personally I think it would be super cool to play with Devin Townsend, can’t see this happening in the very near future though, ha-ha. Blistering.com: Do you believe it’s tougher in today’s music scene to gain and maintain a band following- even with the instantaneous technology at most consumer’s fingertips with the internet, cell phones, and social media websites? Sorvo: It kind of is. The technology has come a long way in the last ten years. Nowadays it is possible to record a decent sounding full length album with almost no cost if you have the right equipment and know what you are doing. This naturally leads to the fact that there are a lot of generic bands out there with music with good production, but lacking in originality. The competition is fierce and it’s hard to stick out from the masses. The brighter side of the matter is that you still need to make interesting music for people to like it. The positive side in all the technological advances is that bands can themselves produce a lot of content such as music videos, content for the social media and provide their own music online. You are no longer forced to solely rely on a label or such to function as a band. Blistering.com: What worries you most about the world we live in? Are there one or two particular areas you think globally that leaders need to put their focus on? Sorvo: There are a lot of messed up things happening in the world. If you actually start doing some research on various topics it comes to the point where everything just becomes overwhelming and you actually just want to actively forget everything about it and continue living in your own small and safe world. There is a lot of poverty, famine, environmental issues, a lot of injustice… the list keeps going forever. The truth is that money pretty much rules the world we live in. Big corporations can have more political influence on different matters than a single country. This is to me personally a very scary thing. Since a corporation’s primary objective is to make revenue, everything else is secondary. This often has many negative side effects. As an individual, I feel that there isn’t much I can do about the problems. One could of course argue that this is the wrong attitude. If everybody would think like this, no change would ever happen. Luckily there are a lot of people in the world that try to make a difference. Blistering.com: How much do you think environment affects the outlook of a band? Because Finland is well known as having harsh, cold winters and times where the sunlight doesn’t appear at all- does this have an effect on personality and sense of humor in your country? Sorvo: Obviously the environment has an effect on us, we are all very pale! Joking aside, I’m convinced that people are the product of their environment. The social mentality and environmental conditions in your country have a huge impact on shaping your personality. Since the winters are dark, long and cold most of us are pretty introverted compared to other European countries. A bit exaggerated, in the traditional Finnish mentality you aren’t allowed to be openly proud about anything unless you want to be labeled as a self-centered douchebag. That being said, I think most Finns of the younger generation have a really good sense of humor and are easy to come along with. Blistering.com: What are your short term goals and long term goals for Shear through the rest of 2012 and beyond? Sorvo: Short-term we want to play as many gigs as possible to support the release of Breaking the Stillness. We are also going to continue the writing process of new material and start planning on our second album.